This AtomicWriter grades your writing on how accessible it will be to your audience. So that you can optimize your writing for your readers to increase article management. It also allows you to track your content’s performance using their Insights tool. AtomicWriter pulls insights from your readers’ behavior to make recommendations that will help you really connect with them. It is a tool that reveals who your audience is and guides you through the editing process of creating content just for them. How To Get Atomic Writer? AtomicWriter provides a Chrome extension that helps content creators write for their audience and the internet. If you are a WordPress user, I highly recommend to download its WordPress Plugin, it is completely free. It also has a web app interface for those who blog outside of WordPress or for those who don’t use the Chrome browser, making the tool available to everyone. General – Your audience has a basic understanding of the content topic and theme. It includes beginner, novice, basic. Knowledgeable – Your audience has an advanced understanding of the content topic and theme. It includes aware, familiar, informed. Specialist – Your audience has a superior understanding of the content topic and theme. It includes – advanced, trained, well-versed. Academic – Your audience has a proficient understanding of the content topic and theme. It includes – scholarly, collegiate, masterful. Genius audience – Your audience has an expert understanding of the content topic and theme. It includes – expert, brilliant, intellectual. 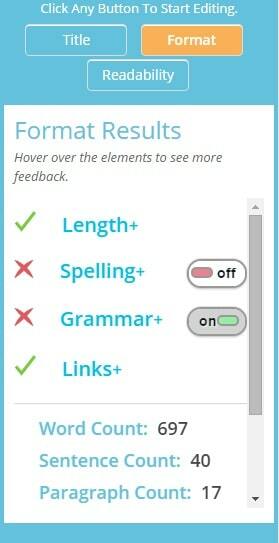 You can select any of the above-mentioned audience and click on ‘Get Editing Feedback’ to see the analysis. Atomic Score helps you achieve or exceed your overall average every time you blog. This enables you to get maximum impact in your content’s performance and consistently provides your readers with high-quality content. 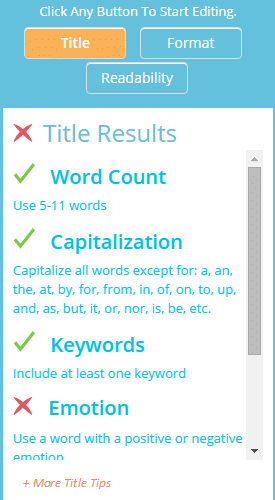 You will be seeing three buttons to start editing – Title, Format, Readability. The above snapshot is showing the different options under ‘Readability’ (highlighted one). You can set this options – ‘ON’ or ‘OFF’. 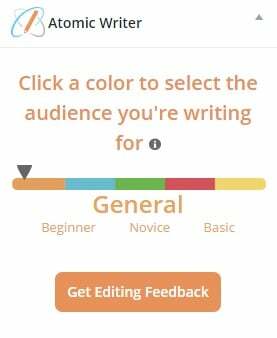 The option you want to edit you can set it ‘ON’ and start editing to utilize the power of this tool to improve your writing. How AtomicWriter help in Content? Similarly, AtomicInsights dashboard will be able to track your content’s performance, content engagement data, atomic insight and know the most optimal time to share your content to your social networks. If you are already using AtomicWriter, I would love to know your experience with it. You can use the comment section for giving your feedback.